BLOGGERS UNITED is getting bigger, better and stronger! :) We're about to experience the 7th leg (can't believe 7 na!!!) of this most-awaited interactive shopping event on May 10 at Metrotent Ortigas! 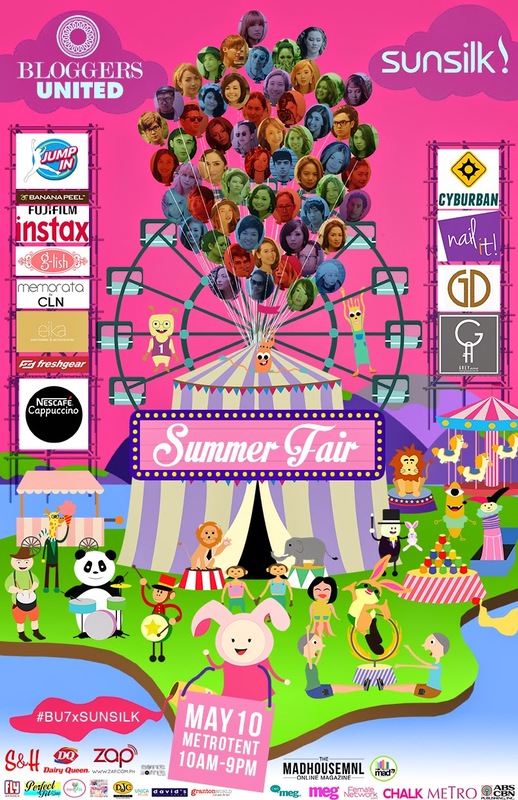 We're partnering with SUNSILK, by the way, so you can expect nothing but the grandest summer fair ever! Now a biannual tradition for Manila's top fashion and beauty bloggers, the Bloggers United 7 x Sunsilk's SUMMER FAIR will feature 50+ bloggers' booths where your favorite online style icons will be selling affordable pre-loved and brand new items, as well as sponsors' booths who each have their own exciting promos and gimik. Aside from this sought-after shopping experience and meet-and-greet, Sunsilk brings in more fun and adventure to the event with game booths, challenges, a pop-up salon, and other surprises for you and your #SunsilkHairkada!